Philips has just unleashed a trio of 4K televisions at IFA 2014, with its first ever curved TV taking the headline slot. The Philips 8900 comes in at 55 inches and features a 3-sided Ambilight design for moody viewing, with the promise of the upmost sharpness and 3D support. Meanwhile the TV's LED backlight will adjust to the ambient room light to make sure you've always got a vibrant view. And as it's powered by Android (4.2.2 Jelly Bean), you'll have access to plenty of apps on the Google Play Store, while 4 HDMI ports should mean wire-switching is kept to a minimum. Philips tells us this one will be available in Europe in Q3, so it shouldn't be too long to wait. Then we have the Philips 9100, which is perhaps a better choice for those who care less about curves and more about a big blockbuster experience. The 4K set is nice and slim, and comes bundles with a wireless sub-woofer and 4-sided Ambilight for added immersion. It'll be available in 55-inch and 65-inch variants, and yup, this one's also Android-powered. Expect it to touch down in the third quarter of this year also. After that we have the Philips 7900, which is interesting for one big reason: Philips says it's the company's "the most affordable" 4K Android TV. Of course, that's completely relative, so this could still be a pretty penny when prices are finally announced. 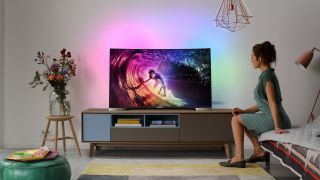 But we do know that the "reasonably priced" TV features a Pixel Precise Ultra HD engine for upgrading the picture to a UHD resolution, along with a two-sided Ambilight, frameless design. The set will be available in 49 inches and 55 inches, and also in Q3, we're told.